1,393 km of cycling - as the end of a bicycle world trip - from the Namibian border southwards via Springbok and Strandfontein at the coast, inland to Cederberg Mountains and to Sanddrif with Wolfberg Arch, via several mountain pass roads to Africa's southernmost point at Cape Aghulas, via Hermanus, Gordon´s Bay and False Bay Cape of Good Hope, via Simon´s Town to Table Mountain and Cape Town. Do you like Cycling South Africa? With crossing Orange River I entered a country for the 42nd time on this trip. If not before already, at least from here the southeasterly wind, that was getting stronger and stronger the further south I went, started to become a constantly blowing strong headwind. After two and a half days of fighting against it I took a small turnoff on a gravel road to the coast, though this didn´t really cause any changes of this windy problem. I reached Strandfontein, packed with weekend tourists mainly from Cape Town, and followed the coast on a rough and sandy gravel road to Lamberts Bay, before turning inland again to Clanwilliam Dam. I took a day off, before preparing myself for a couple of days of gravel roads. I cycled into Cederberg Mountains, famous for its spectacular sandstone formations and well known as a prime hiking and rock climbing area. It got pretty hot and it was quite exhausting to follow the rough gravel road which was partly fairly steep. I climbed Uitkyk Pass and went to Sanddrif, a camp used as a base to reach the famous Wolfberg Cracks and Wolfberg Arch. Next morning I started walking, packed with my backpack and food for a day, and climbed to the huge cracks at the impressive sandstone table mountain which overlooked the camp site. There was an "easy" and a "difficult" way. The latter surprisingly required indeed some slightly serious climbing, was partly pretty narrow with tremendous rock arches and in its end one got rewarded with quite tricky climbing passages, particularly when climbing with a backpack. Therefore it was strongly not recommended for those being alone. Easy to imagine which way I choosed, as it couldn´t be my fault, that there was no one around to join me... :-) Well, I made it up to the plateau and hiked through impressive sandstone formations all the way to Wolfberg Arch, a mighty rock arch further north, before spending the rest of the day with climbing and wandering around the fascinating rock formations and then later descending by taking the wider crack. On bumpy roads I kept on going south next morning by following the road over Grootrivier Pass and Blinkberg Pass and later on a couple of mountain passes down and back to inhabited areas. Soon I found myself enjoying a strongly blowing headwind again and fighting against it in not much more than walking pace, what didn´t really made things more comfortable on these narrow highways. Nevertheless I had decided to go as far south as possible on this continent. I had pitched my tent overnight a couple of kilometres north of the Cape and so I had the place all for myself, when pedaling over a couple of rocks which supposedly were the southernmost rocks to cycle on in the whole of Africa. I had reached Cape Aghulas, the African continent´s southernmost point, where Indian and Atlantic Ocean met each other. Somehow I was pretty happy to be all on my own at this place. Somehow it was just an ordinary stretch of rocky coast, similar to any other stretch of coast nearby. But somehow this place was special, magical, cause this was the end. It was the end of the long haul through Africa and it was the end of the long ride around the globe. I watched the ocean for a good while, then in my mind this trip was over. 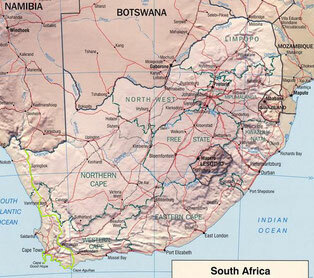 I turned westwards, still about 400 kilometres to go to Cape of Good Hope and Cape Town. I tried to stay at the coast as close as possible and took a last day of rest in Hermanus, which was considered to be the world´s best land based destination for whale-watching. Unfortunately the season was over since about a week already, but the day before people supposedly had still seen whales. I walked along the Walker Bay´s cliff paths for hours, constantly watching the ocean´s surface, hoping to get a glimpse of one of these fascinating creatures. I didn´t see any whale that day, but the time on these cliffs was good to me though. It was like a final deep breath before eventually and actually arriving. Next day I moved on to Gordon´s Bay, where I accidentally ran into Anna and Anna from Germany, who I had got to know at Sossusvlei Dunes in Namibia a couple of weeks ago. In Sir Lowry´s Township they were working as volunteers in a kindergarten and a kind of a soup kitchen and, of course, I was pretty keen on giving this kitchen a visit. And so we went to Fila´s simple house, where she had dedicated her life to the township´s children. It was a lovely place, full of kids coming here for playing, singing and once a day for a simple meal for free. In the evening we made Braai, barbecue in Afrikaans, on the balcony of the girls appartement, before I moved on next morning. The only reasonable way to get from here to Cape of Good Hope is to stay at the coast of False Bay and to inevitably pass Cape Town´s southern townships. I got warned about this "dangerous" area, but as so often before, nothing happened, and, of course, I made it all the 20 kilometres between coast and townships without the slightest problems. The road turned south more and more, I left the last towns and suburbs behind me, it started to rain and for the very last time I took a turnoff south, the one to Cape of Good Hope. But contrary to Cape Aghulas this place was packed with crowds of tourists, had a huge parking area and was simply too busy. Although the rain had stopped in the meantime I just cycled down to the Cape of Good Hope, Africa´s southwesternmost point, for a couple of pictures, before I left the place quickly and turned back north again. I stayed overnight in Simon´s Town for getting the opportunity to visit the only land-based colony of the African Penguin. Only a couple of years ago two of these rare species had conquered a beautiful beach in a tiny bay nearby. Right now an entire colony called Boulders Beach its home. Next morning in the hostal I carried my bike down the stairs, followed by a second run with my four bike panniers, the handle bar bag and my backpack. I mounted the panniers and the handle bar bag and packed the backpack on top of the two rear panniers. Afterwards I pushed my bike onto the street, got on it and started cycling. I started cycling for the very last time on this trip. I followed the west coast and made a last long sweep around the Twelve Apostles, Table Mountain and into Cape Town downtown to Ashanti Lodge Backpacker Hostal. Spontaneously Leo, cyclist from Canada, gave me a hand with pushing my bike up the stairs on my very last metres. The computer stopped with 45,586 km. Next day surprisingly Ben and Jessica, cyclists from England and Canada, who I got to know in Swakopmund, Namibia, arrived as well. I met up again with Anna and with Andre and Emile who I had met before at Fish River Canyon in Namibia. We went for night strolls through bars, climbed Table Mountain, hiked at Hout Bay and went to Cape Town´s beaches. With Andre I head for an open air psytrance party and on my last remaining day I met up with Andrew and Liziwe for a township tour. They were friends of Jeannette, a Dutch cyclist I had met in Bolivia, who was helping guesthouses here in the townships with her recently set up company Movingpeople. Ben had been on the road for about two and a half years as well and in Namibia already we had figured out that we were going to finish our trips at exactly the same day at nearly the same time at Cape Town Airport. And so we catched a taxi together, in the back our bicycles packed in boxes, went to the airport at 4:00 a.m. and checked in. Therefore Ben was the last cyclist I had to say goodbye to on this trip. The plane took off and I watched Cape Town, Table Mountain and the Atlantic Coast, slowly getting smaller and smaller. The sun was shining through the tiny window and it put a smile upon my face. Because something incredible had happened, that I would carry throughout my life for good: I had seen the world with different eyes - ...my own ones! Thank you to Steffi, Aurore, Loic, Terry, Lasse, Vladimir, Bartek, Dan, Griffo, Jeannette, Gerrit, Harald, Astrid, Mewes, Gustavo, Douglas, Hugo, Karin, Peter and Andre for cycling and travelling together with me and thank you to so many others, who partly spent just a couple of hours, partly a couple of days with me and to so many people from all over the world who have been so hospitable, helpful and friendly to me. Thank you all so much for sharing your time with me!